CELEBRATE ISRAEL FESTIVAL THE LARGEST JEWISH HAPPENING IN LOS ANGELES!! 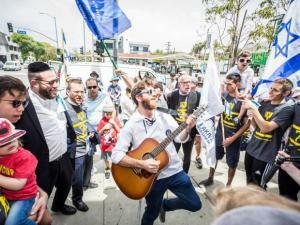 SAN DIEGO, CALIFORNIA, UNITED STATES, March 15, 2019 /EINPresswire.com/ -- Israeli American Council (IAC) has their own unique story to tell, sharing the journey of many who have traveled from Israel to become a proud American. Each with their own account, IAC is keeping these stories alive and helping people stay connected to Israel through their identity. It is the story of leaders, students, mothers, fathers, family members, professionals who all come together through their love of Israel. IAC is here to support Israel and create a vibrant future for the Jewish people and state, keeping them strong and connected. This powerful love of identify will not be unheard, but continue to write the next chapters of their story for the future to come. Visit IAC to read the stories of these strong Israeli-American community members that continue to build a path for the next generation. "Over half a million Israeli-Americans live in the United States today. As a vital component of American society, they play a major role in social activism, academia, culture, and innovation. The Israeli-American Council (IAC) is the largest Israeli-American organization in the United States, serving this vibrant sector of the Jewish American community. Here at Purplepass, we are proud to be apart of this nationwide organization which has been working with us for 4 years now. We are also happy to announce that the IAC has extended their time with us for 3 more years, giving us the honor to continue to put on their amazing events!! With events all around the country, their latest celebration will take place in Los Angeles, California May 19th 2019 12pm - 7pm. “Celebrate Israel Festival” is the largest Jewish happening in LA, with over 16,000 community members celebrating the State of Israel with live entertainment, interactive activities, culture, food & art. 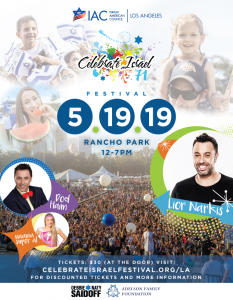 The festivities include a main stage of performances including Lior Narkis, the ultimate challah bake, kosher food, artists from Israel and local vendors, amusement rides, a petting zoo for all ages, and more! All general information you may need for the event can be found here, as well as vendor registration, and more information on attractions. More importantly, tickets can be purchased at Purplepass Ticketing and you also have the option to purchase tickets at the door based on availability.